Summary: Removing an old bath, installing a new bath and fitting a bath panel. Baths come in all shapes and sizes but for the purpose of this project we are going to look at replacing a traditional style bath that is positioned against a bathroom wall and has a panel fitted to the side. When buying your new bath makes sure you have the correct dimensions so it will fit in the space of the one being removed. First you will need to remove the old bath. Turn off the water supply to the bath and turn on both taps to drain the pipes. Disconnect the pipes feeding the taps from the supply pipes. If these are flexible connectors then all you need to do is unscrew the compression joints, but if rigid copper pipes they will need cutting with a hacksaw. Unscrew the trap from the waste pipe. If the bath is fitted against a wall, slide a craft knife around the edge of the bath to break the waterproof silicone sealant. It may also be necessary to remove the lower row of tiles. If the feet of the bath are screwed to the floor unscrew them. Lift out the bath but be careful as this type of bath is awkward to manoeuvre in confined spaces and can be heavy depending on the material it is made from. If you are installing a cast iron bath, you must ensure the floor is strong enough to bear its weight. To distribute the weight evenly, place planks or blocks of wood under the legs. This is also a good time to fit isolating valves to the water supply pipes if they are not already fitted. Working in a room where you have adequate space turn the bath upside down with a dustsheet underneath it to prevent the rim being marked or scratched. Attach the feet to the frame on the underside of the bath. 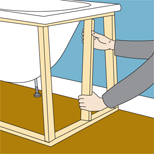 Turn the bath the correct way up and carefully manoeuvre it into position in the bathroom. Working underneath the bath, fit the plughole in place and hold it firmly while connecting it to the bottom of the waste pipe unit. With the overflow faceplate on the inside of the bath feed the overflow pipe into the overflow hole and screw it to the faceplate. The other end of the overflow pipe should then be fitted to the overflow inlet on the waste assembly unit. Place the gasket over the holes at the head of the bath that accommodate the taps. 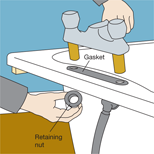 Push the tails of the taps through the holes ensuring the tap unit sits neatly on the gasket. The retaining nuts supplied with the tap can then be tightened. 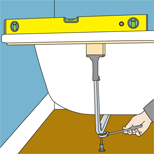 Check the bath is in the correct position and place a spirit level on the rim to check that it is perfectly horizontal. You can adjust the feet to raise or lower the height of the bath. If the floor is uneven or the bath is heavy, place blocks of wood under the feet and fix these to the floor. Once you are satisfied that the bath is level and in the correct position, drill pilot holes and screw the feet to the floor. The bath will come with support brackets that need to be fitted to the timber frame under the rim and the wall. 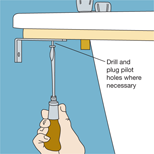 Drill pilot holes, insert plugs if needed and screw the brackets into position. 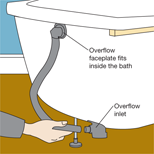 With the bath now firmly secured in position, reconnect the tap tails to the supply pipes using flexible connectors and compression joints. Screw the trap onto the waste assembly unit and reconnect it to the waste outlet. It is now a good idea to reconnect the water supply and check for leaks. Feed the overflow pipe into the overflow hole and screw it to the faceplate. 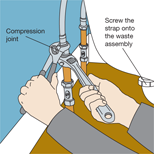 With the gasket over the holes, push the tails of the taps through the holes and when sitting neatly, tighten the retaining nuts. When you are sure the bath is level, drill pilot holes and screw the feet to the floor. Fit the support brackets to the timber frame under the rim and the wall. Reconnect the tap tails to the supply pipes and reconnect the waste assembly unit. The sides of the bath not adjacent to a wall will need bath panels fitted to conceal the pipes. 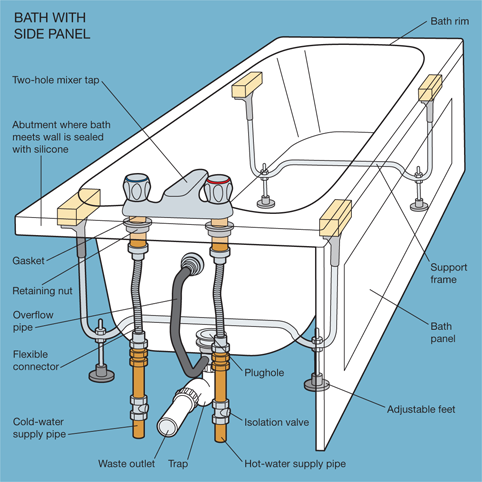 First you will need to construct a frame for each side of the bath requiring a panel. Mark out the position of the frame by using an offcut equivalent to that of the panel. Then by positioning the spirit level vertically from the rim of the bath to the floor, and with the offcut against the inside edge of the spirit level you can mark the position on the floor where the batten has to go. By repeating this process at different points along the bath's edge you will end up with a series of marks on the floor that when joined together with a straight edge will indicate the position of the battens that need to be fitted to the floor. Cut pieces of batten to fit the lines you have marked on the floor, drill pilot holes into the floor through the battens and screw the battens firmly in position. With the horizontal battens in place you now need to measure and cut shorter battens to fit vertically between the rim of the bath and the floor battens. For each there needs to be a batten at each end and one in the centre. Screw the vertical battens into the rim and the floor battens by angling the screws. Cut your panels to size using a jigsaw. The panels can be scribed to accommodate uneven walls and the skirting board. After drilling pilot holes through the panels and into the battens, screw the panels in position. Replace the lower row of the tiles you removed at the beginning of the project. Before sealing the joints between the walls and the rim of the bath with silicone sealant fill the bath with water to ensure the weight of the bath when filled with water will not pull the sealant away. Mark out the position of the frame using a spirit level. 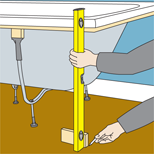 Measure and fit battens to fit vertically between the rim of the bath and the floor battens.